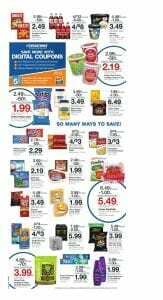 Ralphs Ad Apr 17 – 23 has been published. Check it out on the preview page. Learn How To Do Coupon Matchups and save even more with Ralphs. Please subscribe to this category to get e-mails of upcoming Ralphs ad. Feel free to leave a comment. Use weekly ads to do coupon matchups and save even more than regular savings! Fresh Foster Farms chicken split breasts, drumsticks, seedless mandarins and more fresh products are in the range of Ralphs Weekly Ad Preview. BOGO Free Thomas' English muffins or bagels this week at Ralphs stores. Save with digital coupons. Lower the costs of each product by $2 using the digital coupons that are redeemable up to 5 times. Red Baron pizza, Dannon or Chobani Greek yoghurt, Tyson chicken, and Dreyer's ice cream are on the first page with digital coupon savings. Browse also the 3 days digital deals with featuring coupons on Frito-Lay Simply or SunChips, 32 oz Kroger cheese, Keebler townhouse or club crackers, Nathan's paper towels, and more. You can buy a lot of things from different categories like chips, soda packs, packaged foods, and more using coupons. Keep your home clean and care about your body with high-quality personal care items. Pepsi or 7UP, Vitaminwater, Lay's Potato chips, more snacks, more beverage products are multiple-buy deals. For example, Buy 2 of Kroger deluxe ice cream to pay only $5. 3 of Pepsi or 7UP 12-pack, 12 fl oz. cans will be $11. St. Patrick's Day foods are also a popular part of the new Ralphs Ad. Boneless corned beef brisket, Oroweat rye bread, Private selection potatoes, and Claussen sauerkraut are great foods for St. Patrick's day in the Ralphs Weekly Ads. Follow the Facebook page to get more deals, future ad preview, and more. 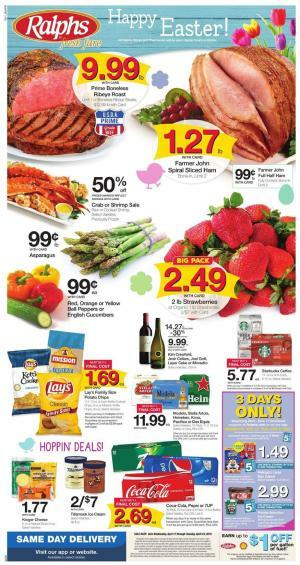 4-days-only sale, digital coupons, Lenten specials, great deals on drink, and special fresh produce deals from Ralphs Weekly Ad Grocery Sale! Ralphs always offers great deals on grocery products. One of the biggest deals is Jennie-O lean or seasoned ground turkey. Its price is only $2.47 at Ralphs Stores. Kroger boneless corned beef brisket is only $1.99 with a limit of 2. Buy 8-piece fried, baked or BBQ baked chicken for only $6. 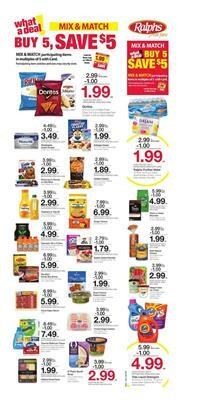 Use this weekly ad to find digital coupons. Frito-Lay party size chips, Tyson frozen chicken, and many more products are digital coupon offers this week. Find many products from different categories. Laundry detergent, Palmolive dish detergent, Dreyer's ice cream, post cereal are also among the digital coupon deals. Snacks and fridge food are always nice to have some at home. They are instant food, guest welcomers, tasty offers from Ralphs Ad. The new mix and match sale participating items, 4-days-only sale, weekly grocery deals, 4x fuel points, and the deals on pet supplies are great savings from Ralphs Weekly Ad Feb 27 - Mar 5. One of the major sales is mix and match sale. Therefore, it's really profitable with participating items that are $1 cheaper each. Buy 5, Save $5 on the participating items. Fresh meat, fruit, and veg are on sale. Fresh foster farms chicken is a BOGO Free deal this week. California Sumo mandarins, blueberries, turkey or chicken breast are the promotions on the first page. Browse 4-days-only sale is a discount on Don Francisco coffee, Fresh Simple Truth natural ground turkey, Pepperidge farm snack crackers, and more fine foods. Ralphs Ad has chips, water packs, cereal, orange juice, cheese, Gatorade, Haagen-Dazs, packaged food, and more products in the "mix and match" sale. Buy favorite soda packs including Coca-Cola and 7UP, breakfast foods, Lipton tea, LaCroix sparkling water which are available on pg 2-3. Also, see the pet supplies deal on pg 7. This week, you can browse pet pride dog food, nudges dog treats, Beneful prepared meal, and more for lower prices. Spend $30 to save $10 on pet products. Special offers of the week with more details are viewable on pg 7. These prices are valid when you buy 5 participating items. Subscribe to Ralphs Ad for the newsletter in your inbox. Today, mix and match sale is an opportunity to save $5 on 5 items. The product range of the mix and match sale includes a popular weekly snack, grocery, pantry items such as Nabisco family size Oreo cookies, Tropicana orange juice, Coca-Cola packs, Green Mountain coffee, Kraft's natural cheese, Gatorade. Browse the participating items on pg 2-3. Multiple sales like the prices that are valid when you buy a certain amount of a product is also an important discount of the week. Check out Coca-Cola, Pepsi or 7UP that will be $.88 for 4 products of 2L bottles. Additionally, the Ad profitable deals like BOGO Free and big packs are the contents you can find. Ralphs also offers $1 discount on per gallon of fuel. Check out the details of that deal on the first page. The advantages of shopping at Ralphs is really convenient. They offer 2-hour delivery which is a great time-saving service for working people. The line in front of the counter might be so annoying after a full working day. Shop online at the office and get your groceries when you arrive at home. Prime Boneless Beef New York Strip Steaks $19.99 lb. Happy Valentine's Day! 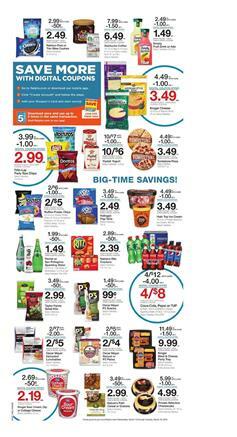 Ralphs Ad has offers in Valentine's Day section which can be browsed on pg 2. Rose arrangements cost only $49.99 this week. Candy arrangement is also on sale and it is $14.99! Candies, chocolate boxes, rose bouquets, cupcakes, and more treats can be easily found in the Ralphs Ad and other weekly ads. Digital coupons are a great discount in the new ad. Find 5 different items on the first page of the ad. Each can be purchased at a cheaper price when you buy with digital coupons. Tide laundry detergent, Sargento cheese, Coffee-mate creamer, Marie Callender's dinner or bowl, General Mills cereal are the featured items in the digital coupons selection. You have lower prices of strawberries, asparagus, Honeycrisp apple, prime boneless NY Strip steaks are on sale. Browse the cover page for all these nice discounts. Browse an extensive range of digital coupon featured items on pg 3. Snacks, pantry, beverage and breakfast foods are usually the products of digital coupons. There is also a 10 for $10 sale in the ad. Check out pg 5 for details of it. Earn 4x fuel points with gift cards. 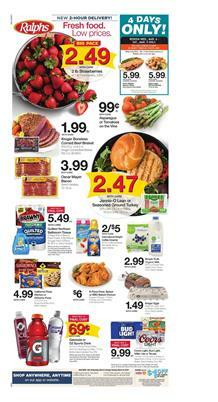 Follow the Facebook page for more deals and future Ralphs Weekly Ad posts.